* Senior club appearances and goals counted for the domestic league only and correct as of 22:20, 4 December 2016 (UTC). Jordan Brian Henderson (born 17 June 1990) is an English professional footballer who captains Premier League club Liverpool. He also plays for the England national team and is usually deployed as a central midfielder for both club and country. Henderson was born in Sunderland, Tyne and Wear and joined the youth system of his hometown club Sunderland aged eight. He signed a professional contract with the club on 1 July 2008. He played his first league game for Sunderland as a half-time substitute on 1 November 2008 in a 5–0 away defeat to Chelsea. He then made his first Sunderland start and home debut against Blackburn Rovers in the League Cup. In January 2009, Henderson joined Championship club Coventry City on a one-month loan deal. He made his Coventry debut in a 2–1 defeat to Derby County. Henderson's loan to Coventry was extended until the end of the season, and he scored the first senior goal of his career on 28 February 2009 against Norwich City. 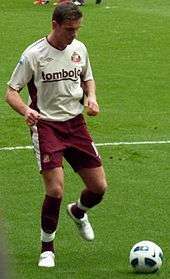 After picking up an injury, a fracture to the fifth metatarsal bone in his foot, he returned to Sunderland in April 2009. In the 2009–10 season, Henderson broke into the Sunderland first team and made several Premier League appearances. He scored his first senior goal for the club against Birmingham City in the League Cup third round. He then went on to score his first Premier League goal against Manchester City on 19 December 2009. Henderson spent the majority of the season on the right side of midfield but played centrally in the absence of Lee Cattermole; his versatility and consistency earning him a new five-year contract on 23 April 2010, keeping him with the club until 2015. He also went on to win the Sunderland Young Player of the Year award for the 2009–10 season. On 13 January 2011, Henderson was listed on the official FIFA website as one of 13 young players to watch in 2011. He was named Sunderland's Young Player of the Year for the second season running. On 9 June 2011, Henderson was transferred to Liverpool for an undisclosed fee, thought to be between £16 and £20 million. He made his debut in Liverpool's first game of the 2011–12 Premier League, a 1–1 draw against his former club Sunderland where he was given a mixed reception by Sunderland fans. On 27 August 2011, Henderson scored his first goal for Liverpool in a Premier League fixture at Anfield against Bolton Wanderers. On 26 February 2012, Henderson started on the right of midfield in Liverpool's 2012 Football League Cup Final victory over Cardiff City before being substituted in the 58th minute. On 5 May, he played the full 90 minutes as Liverpool were beaten 2–1 by Chelsea in the 2012 FA Cup Final. Henderson ended the 2011–12 season with two goals from 44 appearances. In August 2012, Henderson was told he would be allowed to join Fulham by new manager Brendan Rodgers, but this was rejected by the player. He went on to score his first European goal for Liverpool on 6 December 2012, with the winner against Udinese in the UEFA Europa League as the Reds qualified for the last 32. Henderson established himself as a regular member of the Liverpool team in the 2013–14 season, playing in 35 Premier League matches before he received his first career red card in a 3–2 win over Manchester City on 13 April 2014, resulting in an automatic three match ban which meant he would miss three of Liverpool's last four matches. On 29 September, he made his 100th appearance for the club as Liverpool won 1–3 at Sunderland. Henderson started the season in good form, providing two assists in Liverpool's first three league games, and was named as the club's vice-captain following the departure of Daniel Agger. 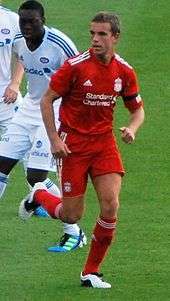 On 29 November, Henderson started as the captain for the first time for Liverpool in the Premier League against Stoke City as Steven Gerrard stayed on the bench. On 2 December, Henderson marked his 150th appearance for the club by scoring the third goal in a 3–1 win against Leicester City to confirm the win. Henderson started many Liverpool games as captain as Gerrard was out injured or being rested on the bench. On 23 April, Henderson signed a five-year contract extension at Liverpool worth £100,000 a week. Following the departure of Steven Gerrard in June 2015, Henderson was made captain of Liverpool. After aggravating a heel injury Henderson underwent surgery, but broke a bone in his right foot before he could rejoin the starting line-up. It was reported that Henderson's heel problems stemmed from the incurable condition plantar fasciitis. Henderson has represented England at four different levels. He made his debut for the under-19s against the Czech Republic in 2009, before breaking into Stuart Pearce's under-21 squad. He scored his first goal in an England shirt in the European U21 Championship play-offs against Romania, hitting a volley from outside the box to give England the lead. Henderson was selected in the England U21 squad for the 2011 European Championships. However, England were knocked out in the group stage. He captained the England U21 team in a 6–0 win over Azerbaijan U21 on 1 September 2011, scoring one goal in the Euro 2013 qualifier. He then scored his fourth under-21 goal in a 2–1 win away at Norway, maintaining England's 100% record in Euro 2013 qualification. On 3 February 2013, Henderson was named the England U21 Player of the Year in the inaugural year of the award. He captained the under-21 side at the 2013 UEFA European Under-21 Football Championship. On 11 November 2010, Henderson was omitted from England's U21 squad for their friendly with Germany, instead receiving his first call up to the senior England squad on 17 November 2010 for their friendly against France. He made his debut in the match, playing from the start in central midfield alongside Steven Gerrard. Initially named as a standby player, Henderson was called up to the England Euro 2012 squad to replace the injured Frank Lampard. He featured in England's first game of the tournament against France, coming on as a late substitute for Scott Parker, and again featured as a substitute, coming on during extra-time, in England's quarter-final penalty shoot-out defeat to Italy. Henderson was selected in Roy Hodgson's 23-man squad to travel to Brazil for the 2014 FIFA World Cup. He started in England's opening two World Cup group matches, 2–1 losses to Italy in Manaus and to Uruguay in São Paulo. Henderson also went to Euro 2016 with Roy Hodgson in France. He only played one match that being the final group match against Slovakia which ended 0-0 as England finished second in their group. Henderson plays as a box-to-box midfielder and is widely regarded as a player who works hard and brings energy to the team. Described as an "athletic and hardworking midfielder," Henderson has developed his game during his time at Liverpool into a more creative player. Furthermore, he constantly presses high up the field whenever the opposition is in possession. Henderson was schooled at Farringdon Community Sports College before joining Sunderland as a youngster. He was a Sunderland fan as a child and was spotted at the 2014 League Cup Final with the Sunderland fans, whilst being a player at Liverpool. On the same day as being named Liverpool captain, it was announced he would also be featuring alongside Lionel Messi on the cover of the UK edition of FIFA 16. 1 2 3 4 Hugman, Barry J., ed. (2010). The PFA Footballers' Who's Who 2010–11. Edinburgh: Mainstream Publishing. p. 194. ISBN 978-1-84596-601-0. ↑ "Player profile: Jordan Henderson". Premier League. Retrieved 14 April 2016. ↑ Lightle, Sam (4 February 2016). "The rise of Jordan Henderson". Sunderland A.F.C. Retrieved 26 March 2016. ↑ "Blues batter Black Cats". Sky Sports. 1 November 2008. Retrieved 1 November 2008. ↑ McKenzie, Andrew (18 December 2008). "Sunderland 1–2 Blackburn". BBC Sport. Retrieved 18 December 2008. ↑ "Coventry sign Henderson on loan". BBC Sport. 29 January 2009. Retrieved 29 January 2009. ↑ "Derby 2–1 Coventry". BBC Sport. 31 January 2009. Retrieved 31 January 2009. ↑ "Henderson to extend Coventry loan". BBC Sport. 23 February 2009. Retrieved 24 February 2009. ↑ "Norwich 1–2 Coventry". BBC Sport. 28 February 2009. Retrieved 20 December 2009. ↑ "Henderson back at Sunderland". Sunderland A.F.C. 8 April 2009. Archived from the original on 10 April 2009. Retrieved 8 April 2009. ↑ "Sunderland 2–0 Birmingham". BBC Sport. 22 September 2009. Retrieved 26 September 2009. ↑ "Man City 4–3 Sunderland". BBC Sport. 19 December 2009. Retrieved 20 December 2009. ↑ "Young pair sign new deals". Sunderland A.F.C. Archived from the original on 31 August 2010. 1 2 "Jordan Wins Player of the Year". Jarrow & Hebburn Gazette. ↑ "Players to watch in 2011". FIFA. 13 January 2011. 1 2 "Bardsley secures awards double". Sunderland A.F.C. 18 May 2011. Archived from the original on 11 August 2011. 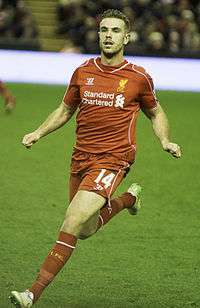 ↑ "Reds agree Henderson deal". ↑ Doyle, Paul (13 June 2011). "Jordan Henderson aims to reward Liverpool's faith and £20m investment". The Guardian. London. ↑ "Liverpool and Sunderland agree transfer fee for Jordan Henderson". The Daily Telegraph. London. 8 June 2011. ↑ Jones, Neil (10 June 2011). "Liverpool FC's Jordan Henderson on his transfer to Anfield and his dreams for the future". Liverpool Echo. ↑ "Jordan Henderson completes Liverpool move". ↑ "Liverpool complete Jordan Henderson deal". BBC Sport. 9 June 2011. Retrieved 9 June 2011. ↑ Smith, Rory (13 August 2011). "Liverpool 1 Sunderland 1". The Daily Telegraph. London. Retrieved 16 August 2011. ↑ "Rampant Reds beat Bolton". ESPN Soccernet. 27 August 2011. Retrieved 30 August 2011. 1 2 "Cardiff 2–2 Liverpool". BBC Sport. 26 February 2012. Retrieved 26 February 2012. ↑ "Chelsea 2–1 Liverpool". BBC Sport. 5 May 2012. Retrieved 16 April 2014. ↑ "Jordan Henderson". ESPN FC. ↑ "Liverpool's Jordan Henderson was shocked to be told he could leave Anfield". The Daily Telegraph. London. 7 November 2012. Retrieved 16 April 2014. ↑ "Reds analysis: how will Brendan Rodgers cope without Jordan Henderson?". Liverpool Echo. 14 April 2014. Retrieved 16 April 2014. ↑ "Jordan Henderson marks 100th Liverpool appearance with unusual landmark in win over Sunderland". Daily Mirror. London. Retrieved 16 April 2014. ↑ "Jordan Henderson's Profile". whoscored.com. Retrieved 4 October 2014. ↑ "Henderson confirmed as new vice-captain". Liverpool F.C. ↑ McNulty, Phil. "BBC Sport – Liverpool 1–0 Stoke City". BBC Sport. ↑ "Liverpool's Philippe Coutinho deals body blow to Manchester City hopes". The Guardian. London. 1 March 2015. ↑ "Swansea City 0–1 Liverpool". BBC Sport. 16 March 2015. Retrieved 17 March 2015. ↑ "Liverpool's Jordan Henderson signs new five-year deal". BBC Sport. Retrieved 23 April 2015. ↑ "Henderson appointed new Liverpool Captain". Liverpool F.C. 10 July 2015. Retrieved 10 July 2015. ↑ "Liverpool 1-0 Bournemouth". BBC Sport. 17 August 2015. Retrieved 20 September 2015. ↑ Whalley, Mike (16 September 2015). "Liverpool midfielder Jordan Henderson has treatment on heel injury". ESPN FC. Retrieved 21 September 2015. ↑ "Jordan Henderson ruled out for Liverpool with broken foot - reports". ESPN FC. 20 September 2015. Retrieved 21 September 2015. ↑ Turner, Stephen. "Jordan Henderson reveals heel injury 'has no cure'". Sky Sports. Retrieved 31 December 2015. ↑ McNulty, Phil (16 September 2016). "Chelsea 2-1 Liverpool". BBC Sport. Retrieved 19 September 2016. ↑ Prentice, David (3 October 2016). "Liverpool's Jordan Henderson wins September Goal of the Month". Liverpool Echo. Retrieved 4 October 2016. ↑ "Jordan Henderson". The Football Association. Retrieved 3 March 2014. ↑ "Sunderland England news Jordan Henderson dismisses burnout fears ahead of Under-21 European Championship – News". Daily Mirror. London. 31 May 2011. Retrieved 3 March 2014. ↑ "England U21 6–0 Azerbaijan U21". BBC Sport. 1 September 2011. Retrieved 15 January 2012. 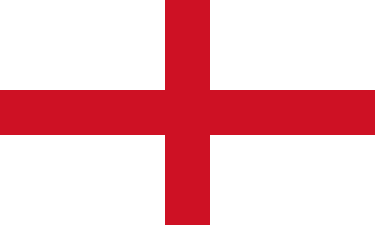 ↑ "Norway U21 1–2 England U21". BBC Sport. 10 October 2011. Retrieved 15 January 2012. 1 2 "Jordan scoops U21s gong". The Football Association. 3 February 2013. Retrieved 3 February 2013. ↑ "England U21s Squad". The Football Association. 14 May 2013. Retrieved 9 June 2013. ↑ Taylor, Louise (11 November 2010). "Sunderland's Jordan Henderson poised for first England call-up". The Guardian. London. ↑ Winter, Henry (17 November 2010). "England 1 France 2". The Daily Telegraph. London. Retrieved 22 November 2010. ↑ "England Euro 2012 squad: Ruddy, Carroll & Defoe in, Ferdinand out". BBC Sport. 16 May 2012. Retrieved 30 May 2012. ↑ "Euro 2012: England's Frank Lampard ruled out through injury". BBC Sport. 31 May 2012. Retrieved 31 May 2012. ↑ McNulty, Phil (11 June 2012). "Euro 2012: France 1–1 England". BBC Sport. Retrieved 11 June 2012. ↑ McNulty, Phil (24 June 2012). "Euro 2012: England 0–0 Italy". BBC Sport. Retrieved 16 October 2012. ↑ "England World Cup squad 2014: Ross Barkley and Raheem Sterling called up". The Guardian. London. 12 May 2014. Retrieved 14 May 2014. ↑ "England's Euro 2016 squad: the 23 picked by Roy Hodgson". The Guardian. London. 31 May 2016. ↑ "England come second as Roy Hodgson's gamble backfires in Slovakia stalemate". The Guardian. London. 20 June 2016. ↑ "Jordan Henderson". Liverpool F.C. Retrieved 28 May 2016. ↑ "Liverpool missed Jordan Henderson and Daniel Sturridge against Chelsea". Metro. London. Retrieved 24 February 2015. ↑ "The Improvement of Jordan Henderson: Stats Analysis". EPL Index. Retrieved 24 February 2015. ↑ Ladson, Matt. "Complete Analysis of Jordan Henderson's Liverpool Role". Bleacher Report. Retrieved 24 February 2015. ↑ Taylor, Louise (14 November 2010). "Jordan Henderson: Sunderland's hidden treasure steps into the limelight". The Guardian. London. ↑ Kidd, Dave (8 March 2014). "Liverpool's Jordan Henderson pays tribute to Sunderland and reveals he watched their Wembley defeat from the stands". Daily Mirror. London. Retrieved 26 March 2016. ↑ "Jordan Henderson is the FIFA 16 cover star in the UK". FIFPlay. Retrieved 10 July 2015. 1 2 "Games played by Jordan Henderson in 2008/2009". Soccerbase. Centurycomm. Retrieved 18 January 2013. ↑ "Games played by Jordan Henderson in 2009/2010". Soccerbase. Centurycomm. Retrieved 18 January 2013. ↑ "Games played by Jordan Henderson in 2010/2011". Soccerbase. Centurycomm. Retrieved 18 January 2013. ↑ "Games played by Jordan Henderson in 2011/2012". Soccerbase. Centurycomm. Retrieved 18 January 2013. ↑ "Games played by Jordan Henderson in 2012/2013". Soccerbase. Centurycomm. Retrieved 26 December 2015. ↑ "Games played by Jordan Henderson in 2013/2014". Soccerbase. Centurycomm. Retrieved 26 December 2015. ↑ "Games played by Jordan Henderson in 2014/2015". Soccerbase. Centurycomm. Retrieved 26 December 2015. ↑ "Games played by Jordan Henderson in 2015/2016". Soccerbase. Centurycomm. Retrieved 29 May 2016. ↑ "Games played by Jordan Henderson in 2015/2016". Soccerbase. Centurycomm. Retrieved 12 November 2016. ↑ "Henderson, Jordan". National Football Teams. Retrieved 11 November 2016. ↑ Carson, Liam (31 January 2013). "Jordan Henderson: Future England Captain?". sport.co.uk. Retrieved 12 April 2015. 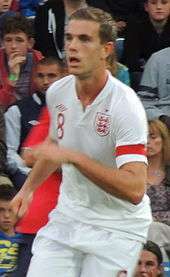 Wikimedia Commons has media related to Jordan Henderson.